We don't know what went wrong at the iron mine in southeastern Brazil on Nov. 5. We don't know what caused the breach in two dams that deluged a town with sludge and mine tailings. So far nine people are confirmed dead, 19 are missing, and the sludge is contaminating the soil and drinking water, perhaps for hundreds of miles. We do know what went wrong after the disaster. The national government's response to the fiasco, or lack of response, already is a study in what not to do. For days, while response teams scoured for survivors, Brazilian national authorities said next to nothing. Brazilian mining conglomerate Vale S.A., joint owner of the crippled mine, also ducked the public at first, opting instead for a perfunctory press release the day after the accident and letting the local operator, Samarco Mineracao S.A., do the talking. (Vale and BHP Billiton, each with a 50 percent stake in Samarco, later held a joint press conference near the mine site and pledged to do all they could to help victims and repair damages. The two companies could face $265 million in liability.) State environmental prosecutor Carlos Eduardo Ferreira Pinto claimed the disaster was no accident; state regulators suspended the mine's license. The silence from Brasilia, however, rung odd. Only this Thursday, seven days after the tragedy, did Brazilian President Dilma Rousseff make it to the stricken region, and even then she surveyed the devastation from a helicopter. Later that day she announced a fine of $66 million against the offending miner, and compared the damage to that wrought by the 2010 explosion BP's Deepwater Horizon oil rig, which killed 11 people and spilled over three million barrels of crude into the Gulf of Mexico. Rousseff might have taken a cue from Chile instead. In 2010, when a gold mine collapsed and trapped 33 men deep underground, newly elected President Sebastian Pinera immediately dispatched his mining minister to the mine site, then flew there himself to oversee the emergency. Pinera then invited NASA engineers to join the rescue effort and was on hand when the last miner was hauled to safety, 69 days later. True, after a brief post-rescue sympathy bump, Pinera succumbed to Chile's toxic politics and his popularity tumbled. But he is still remembered as the leader who turned a disaster into an opportunity. Ever since the corruption scandal at Petrobras broke early last year,Rousseff seems intent on doing the opposite. With single-digit approval ratings, the economy in the tank and talk of impeachment still coursing through congress, she appears to have shut out bad news and hewn to the Panglossian ritual of her job. In the critical days following the mining disaster, while civil defense crews combed the mud for survivors, she hosted Japan's Princess Akishino in Brasilia, then flew to Rio to inaugurate low-income housing and unveil a new metro line. Even in her belated tour of the dam disaster zone, she sounded strangely upbeat. "If we all join hands and work together, we can overcome this crisis more quickly," Rousseff told reporters on Thursday, in a statement that seemed to conflate the tragic mudslides with her own political impasse. A pall of questions hovers over the mining disaster. How did a pair of dams ruled "totally safe" by local authorities fail? Why were people in harm's way not warned and evacuated in time? How can regulators and mining companies ensure the reliability of thousands of remaining containment dams, two dozen of which the federal mining authority lists as "high risk" structures, not to mention the rest of the country's parlous infrastructure? 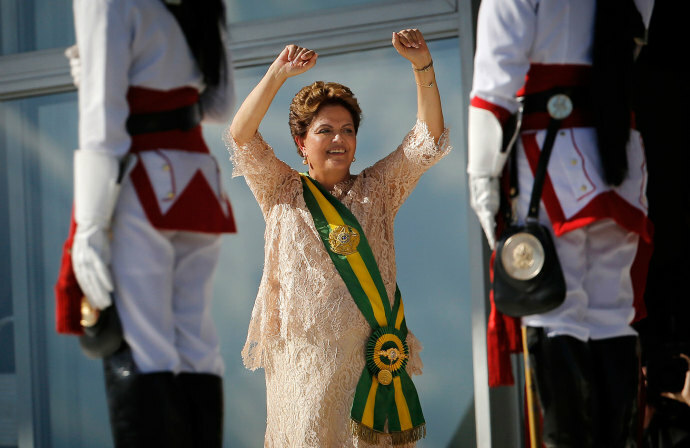 Rousseff was not personally responsible for the tragedy of Nov. 5, nor is she expected to investigate it herself. Instead, she should do what only an elected authority can: Press for explanations, hold local officials' feet to the fire, and start a national conversation about what's needed to prevent future accidents and to minimize the harm from inevitable lapses. She can't show Brazilians that path in a time of crisis if she doesn't show up.